UPDATE: I've referenced all applicable laws about this matter. Click here to read. Just this morning just before 8AM (on July 25, 2013), I left my home in the Inner Sunset District and noticed a white van in my neighborhood blocking my neighbor's driveway. What I saw was shocking. These two guys wearing bright yellow vests started putting up these tow-away signs on portions of my block (see photo). When I read the signs in detail, it said construction zone is effective from July 23rd to July 27th, and during the hours of 7AM to 5PM. The company is Champion Cleaning and their plates are definitely out-of-state. (1) It's 8AM, and I know my neighbors park their car on the street and take the bus to work. Therefore, there is the possibility their car may be towed. 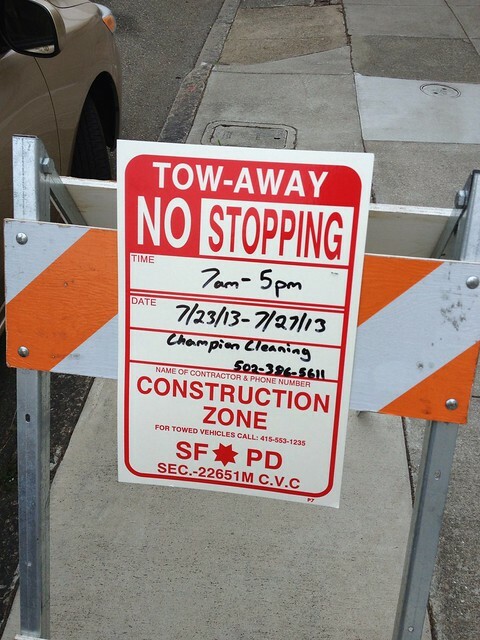 (2) Today is July 25th, and the signs says the construction zone is effective two days prior. (1) Called SFPD Taraval station. The officer on the phone really didn't give a damn and told me to call SFMTA Enforcement (formerly known as Department of Parking and Traffic). (2) Called SFMTA/DPT Enforcement, said I was referred by SFPD Taraval, and person also didn't want to be helpful and referred me to the Department of Public Works. (3) Called Department of Public Works three times and all I got was a generic voicemail line. (4) Called San Francisco 311, explained the circle of phone calls I've made, and the lady took down my information, the full story of the situation, and forwarded it immediately to DPW for follow-up. While I'm currently waiting for DPW to investigate and call me about this problem. I decided to contact a different SFPD station for more information. (1) The signs must be posted at least 72 hours prior to the start of the construction zone. In this case, it should have been posted on my street no later than July 20th. (2) It can only be towed if the construction company requests for it. (3) No private towing company can tow the car. Only an authorized SFMTA tow company can do it. (4) Permits must be on file with various agencies, including the local neighborhood police station. So while it seems that only the construction company can request to have a vehicle towed; if they decide to go the very ugly route of calling to tow cars, there would be some very angry neighbors because there was NO ADVANCE NOTICE of 72 HOURS as per city law. It was important for me to notify the city of the blatant violation of the law so that if a tow happens, it's on public records that I registered an official complaint against the company in question. If you see these signs in your neighborhood and 72 hours notice was not given, please dial 311 and file a report. If you notice cars being towed or the construction workers threatening drivers about possibility of being towed, please call SFPD dispatch at: (415) 553-0123. I've always wondered who the proper authority is to complain about this. Is it really 311? I always figured that SFMTA wouldn't care...because that just seems like SFMTA. There's a church in my neighborhood that often gets special event signs to block off street spots but they are rarely up 72 hours in advance. I've almost got burned a few times when parking in street spots that suddenly ended up with tow away signs the day before they became effective. Anonymous: Regarding the church, either call SFPD non-emergency dispatch at: (415) 553-0123 or call 311 and explain the situation.